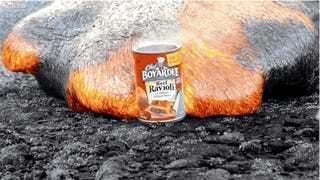 For the weekend: a ridiculously satisfying video of a ravioli can being overtaken by a blob of oozing lava. Not since the disappearing styrofoam have we found ourselves so unaccountably moved by a video so simple (though, admittedly, lava does tend to have this effect on us). We could watch acetone devour styrofoam all. Day. Long. More giddying video goodness here, here, here and here.